The WILD GUITAR! of Arch Hall, Jr.
To fans of celluloid, hot rods and twangin' rock 'n' roll, the name Arch Hall, Jr. is that of a mysterious lost icon. 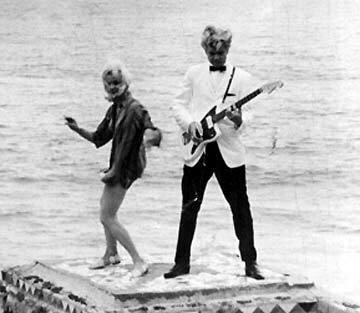 "The Newest Rage In Teenage Music—The Jungle Beat" promised the press book of Arch's 1961 teen exploitation flick, The Choppers in trumpeting an entire album of the teen actor/ guitar kingpin's rock 'n' roll creations. With classic B-movie hustle, the album—if it was ever actually meant to be released in the first place—never got past the mock-up stages. Its' sleeve was displayed in a record store scene in one of Arch's later movies, The Wild Guitar, but that was the end of it. The tragedy of all this is that our man Arch—a first class rock 'n' roller who burned up stages and screens with his band the Archers—was only ever known for his musical talent via a series of movies produced by his dad, Arch Hall, Sr. Which is exactly why the February 22nd 2005 release date of Norton Records' Arch Hall, Jr. anthology, Wild Guitar, is a day that will live in infamy for every rock 'n' roll fan whose been waitin' over forty years for Arch's musical genius to become available in the aural format. The disc in question features all the well-loved songs from his films—"Konga Joe," "Monkey In My Hatband," "Yes I Will" and "Vickie" just to name a few—six of which were originally issued on three rare 45 singles, as well as recently discovered tapes of Arch and the Archers performing live in '62 at a drive-in Theater in Pensacola, Florida and a similarly scintillating set from two years later at a Pasadena, California nightclub. Among the many original numbers on the disc, Arch pounds through favorites like Bobby "Blue" Bland's "Further On Up The Road" and Dale Hawkins' "Suzie Q." This pair of songs is telling as Arch was not only obsessed with the blues, but his guitar idol was James Burton, who framed the lowdown swamp groove on the aforementioned Dale Hawkins hit. Wild Guitars will most certainly be the order of the day when Arch takes the stage, at his first appearance at the Stomp, with two of the original Archers--Alan O'Day and Joel Christie, along with Gene Oliveri. Yeah! RCH HALL JR. & THE ARCHERS - WILD GUITAR (CD 307) Norton Records.